An 18.3 mile scenic drive in the Hawai'i Volcanoes National Park has many scenic stops, side trails and other scenic drives. The drive starts at a fascinating stand of Lava Trees and continues through a large assortment of things to see and do including a huge petroglyph field, and then ends where the lava crosses the road at the ocean. This scenic drive also takes you from an altitude of 4,000 feet to sea level and back again. This road is in the Hawai'i Volcanoes National Park and is a normal paved road. Portions of the road descend over 3,000 feet fairly quickly and there is one hairpin turn - but in general, driving is not a problem. Do exercise caution if it rains, as the wet road can be slippery in spots. Currently the only services available on this drive are simple toilets at the 3.6 mile mark at Mauna Ulu. There is an emergency telephone at the petroglyph field at the 15.9 mile mark. And currently there is a simple toilet at the end of the road. This road has many things to do along the way. You could spend weeks exploring this section of the park. If you intend to take any of the hikes or side roads please be sure to read our reviews of those first. Some hikes require special equipment and on almost all of them, including this drive itself, you should have water, sunscreen, a hat and food if you are hiking. The best time of day to do this drive totally depends on what you want to do. For just general driving, any time of the day is fine. If you are hiking you will probably want to go early in the morning so you can enjoy the cooler air and less direct sun. Sunrises at the ocean can be breathtaking. If you intend to see hot lava - the best viewing is done at night so you would want to arrive before the sun sets so you can hike out to the lava, and then enjoy it into the evening. Early morning, before sunrise walks to the lava are also good. Avoid going to the lava during the hottest part of the day as there is no protection from the sun and the lava is harder to spot. Note that some of the trails noted on this page have warning and cautions of their own. Be sure to look at the full review of any hike mentioned on this page before attempting the hike. To get to the start of this scenic drive, take Highway 11 to Volcano and enter the Hawai'i Volcanoes National Park. Once you pass the park gatehouse make the first left onto Crater Rim Drive. Continue on Crater Rim Drive 3 miles until the intersection with Chain of Craters road. Turn left onto Chain of Craters road. Just as you approach the 0.2 odometer mark you will see a very small two car sized pullout on the left side of the road. If a hike sounds good this is a perfect one hour (one mile round trip) trail that lets you see the absolute best examples of lava trees on the island. The trail begins across the road from where you park, just a bit ahead of your car. 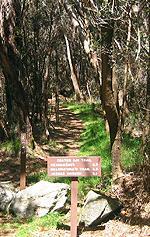 The Crater Rim Trail crosses the road at this point. Cross the road to the entrance of the trail, by the trail sign. Follow the trail for about 1/3 of a mile or so through the nice shady tree line that skirts the 1974 lava flow. Where the trail comes out you will be at lava trees. The hike proceeds to take you the lip of a pit crater and then you double back and walk the lava tree formations all the way back to your car. We have a complete review of this trail. Click here for the 1974 Lava Tree and Keanakakoi Crater Hike Full Details. The lava trees are in the 1974 Lava Flow field. As you walk back to your car through the field you can see hundreds of perfect lava trees, some still containing the wood. The 1974 Lava Flow field borders the road and when you come out you will see your car about 1/4 mile up the road. Continue driving down Chain of Craters, past the 1974 Lava Flow field you just hiked across. At odometer 0.4 you will see a pullout for Lau Manu Crater on the right hand side. Lua means, among other things, a hole, pit or crater. It also means a toilet or bathroom. Manu means a bird, as well as bruised or broken. It can also mean acrid or pungent. Thus, there are many possible meanings for Lau Manu such as Bird Toilet or Pungent Crater. The crater itself is 109 yards in diameter and last had lava flow into it during the 1974 eruption, the same flow that created the Lava Trees near Keanakakoi Crater. Lua Manu Crater in this 6 image stitched photo. Getting back in the car we proceed down Chain of Craters road. 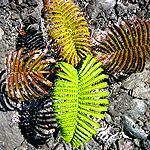 Here you are going through a variety of lava flows interspersed with native 'Ōhi'a, Koa and ferns. At Odometer 0.9 there will be a pullout on the left side of the road leading to Puhimau Crater. All the craters we have seen so far, including Puhimau and more to come are perfect examples of pit craters. This entire section of road is situated between two rift zones. A large channel of magma flows below this area. Occasionally the magma under some particular spot will suddenly drain. The instant change in level can cause the ground above the magma channel to instantly collapse. This creates the pit crater. Pit craters can be formed almost instantly, or can enlarge over a period of time. Often the pit crater starts out shaped like an inverted funnel - smaller at the top and larger at the bottom with the top eroding over time till it forms vertical walls. Lava flows do not accompany the formation of a pit crater since the crater is created by the sudden absence of lava - however many pit craters are filled at a later date by other nearby lava flows. Puhimau is a 500 foot deep crater and is a nice 400 by 650 foot oval in size. If you look carefully you can see that the crater is still steaming in spots. The crater and nearby areas are part of the Puhimau Thermal Hot Spot and magma actively flows below this area. Instead of driving to the hotspot, if you intend to take the Thermal Hotspot Stroll we recommend you stay parked at Puhimau crater. The hotspot is just a bit down the road, about 4/10's of a mile and there is no good parking (there is a narrow pullout just after the hotspot if you don't wish to walk). The Thermal Hotspot was first noticed in May of 1938 after a nearby swarm of shallow earthquakes. The hotspot is very noticeable as there is a sudden absence of trees and plant life on the right side of the road. A fast area, 50 to 100 acres is devoid of most life and you can see that it is even extending on the left side of the road. You can take the narrow paths that come up to the road at the hotspot to enter the hotspot area. 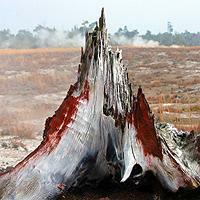 Once you are in the hotspot area you can find thermal steam vents and extremely unusual tree trunks. The roots of the trees have caused small fractures in the rock that lead to magma below the surface. Steam in the rock has used the roots as tubes to escape to the surface thus killing the tree from the inside out. The tree stumps here have extremely unusual colors and both the trees and ground itself is a bizarre texture. The Thermal Hotspot is completely documented in our Thermal Hotspot Stroll. Please visit the hikes page for more details on what to expect and how to prepare for this stroll. At odometer 1.5 you will see a pullout on the right side of the road for Ko'oko'olau Crater. Ko'oko'olau Crater is an excellent example of what happens to a crater after about 200 years of an absence of lava. The crater is completely overgrown with native forest including 'Ōhi'a and Koa trees. The name Ko'oko'olau comes from the flowering plant Ko'oko'olau (Bidens amplectens). You may notice the 1958 USGS Benchmark here showing that this area is 3,521 feet above sea level. Back in the car, we continue down Chain of Craters road to odometer 2.2. This is the junction with Hilina Pali Road. You will see, just past the turn for Hilina Pali, a gravel pullout on the right hand side. Park on the pullout and we can take the short Devil's Throat walk. Looking across Chain of Craters road you will see a dirt trail that leads you about 50 feet to Devil's Throat. Devil's Throat was formed in early 1912. What began as a small pit crater with an opening only 20 feet wide and 250 feet deep has slowly widened over the years and is now about 165 feet deep and 150 feet in diameter. Please read the entire Hike description by clicking here. This hike has several warnings and cautions associated with it! 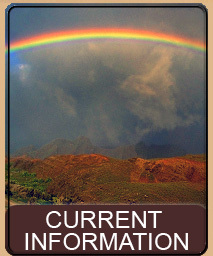 Back to your car, you can take the Hilina Pali Scenic Drive if you wish, or keep going down Chain of Craters Road. If you decide to take the Hilina Pali Scenic Drive it is a narrow, paved 8.2 mile long road that ends up at top of Hilina Pali and offers a stunning costal view. 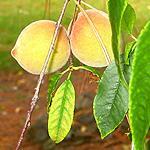 Several stops along the way offer opportunity to take side hikes and explore native plants. 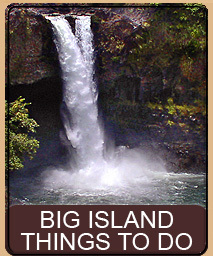 Click here to read the full details on the Hilina Pali Scenic Drive. Returning to your car at the Hilina Pali Junction we continue down Chain of Craters Road. At odometer 2.3 you will see a small pullout on the right and on the left side of the road is a spatter cone that formed about 300 years ago. 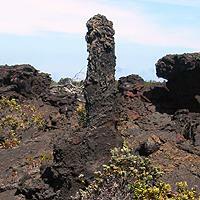 A spatter cone is created when a fissure or vent ejects lava high up into the air. Quite a bit of the lava falls back down around the vent and builds a cone. The lava continues to fountain from the middle of the cone building it even higher. While this particular spatter cone is perhaps not the most outstanding example, it is interesting in that the interior has been exposed due to the construction of the road. Continuing on, at odometer 2.5 we see the pullout for Hi'iaka Crater. This is a rather large area where the ground has slumped, or more accurately, collapsed. On the far side is the actual Hi'iaka pit crater, which is about 1,200 feet wide and 300 feet deep. If one is careful it is possible to descend into the collapsed portion of the crater. The shallow basin is actually part of the forming pit crater. The huge pit crater is depressed 300 feet while the edge, or basin did not collapse as far. As you walk back to your car be sure to look out for young 'Ama'u Ferns which can be seen growing along here. Hi'iaka Crater Basin. The pit crater is not visible from this angle. At odometer 3.1 you will see Pauahi Crater on your left. There is parking and a short boardwalk to a great photographic view. Pauahi is a very large crater, about 1,800 feet long, 350 feet deep, and 300 feet wide. Though the crater is itself very old it has had lava flowing in it recently. In 1973 lava not only flowed in from nearby fissures but also erupted from the crater itself and created a huge lava lake at the bottom of the crater. 1979 saw a repeat performance with eruptions again occurring within and nearby the crater. Stitched photo of Pauahi Crater. While you are at the end of the boardwalk enjoying the view of Pauahi Crater, turn around and note the fissure behind you. You can step off the boardwalk and walk into the fissure, as there are a number of interesting shapes. These fissures spewed lava in fountains much of which came down around the fissures themselves. The molten lava splashed on the nearby rocks creating the bizarre shapes that you see in this area. 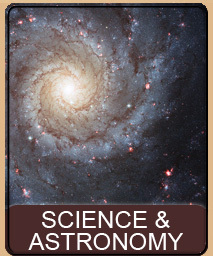 As with many of the other craters Pauahi Crater holds religious significance to the Hawaiians. 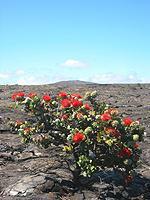 Often you will see Ti leaf wrapped packages, fruit, leis or other gifts sitting near the edge of the crater. These are gifts to the crater and the gods and should not be disturbed. On the left side of the road, at odometer 3.6 is the turn off for Pu'u Huluhulu and Mauna Ulu. The road takes you about 1/2 mile to an oval loop with parking for about 20 cars. There is a handicap accessible public toilet across from the parking lot. This is a very popular area for both visitors as well as locals. A number of very interesting trails are in this area. You can spend as little as a half hour being amazed at some very different types of lava, or as much as two days hiking to the currently active Pu'u O'o vent. When you get out of your car, walk to the right of your car towards the end of road, where you looped into the parking lot. You will see the remains of a gate here and a walkway. Take the walkway. After a few feet there will be a path to the left with a signpost. At this point you can either take the trails to the left or go straight for some interesting lava. If you continue forward on your path, bypassing the left side trail, at the end of the path (about another 20 yards) you will find a field of lava. Looking carefully you can see somewhat of a loose path that heads forward and a bit towards the right. There is a small ridge of lava towards the front/right and that is where you want to head. When you go over the small ridge you will see that it goes downward and onto a flat plain. Continue down and cross the fissure (there are various points along the fissure where it is easy to cross) - noting that in places that fissure must be 70 or 80 feet deep. 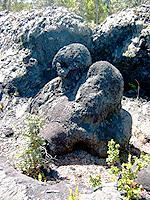 Past the fissure you will see the remains of lava tree clusters that resemble huge balls and other unusual shapes. It is not evident that these are lava trees - and indeed some may be lava coated rocks - but the lava itself is very interesting. Much of the lava is bright, vivid, metallic peacock colors: quite pretty and very interesting. Looking back the way you came along the ridge you can also see splatter, much of it metallic colored. The fissure you crossed fountained lava coating the nearby trees and rocks and building the ledge. You can, if you wish, continue to follow the fissure which keeps going at an angle - you will find more fissures and more forms including a rock that the park calls the ice cream cone - due to the fact that when viewed from the proper angle it looks like an ice cream cone. If you are interested in the Hike described above click here to read all about Irredescient Fissure and Ice Cream Cone Walk. Returning to the path you can go back and take that side path. The side path immediately goes to a sign, which describes the trails. At the very least people take the simple hike to Pu'u Huluhulu. If the day is clear, from the vantage point at the end of the trail you can usually see the active vent Pu'u O'o smoking - and at evening often you can see the lava coming out of the vent. At this point there is only one trail, which takes you out to all the other trails at the junction at Pu'u Huluhulu. 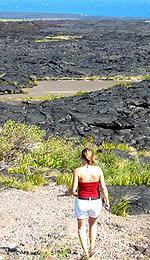 The trails are over open lava fields so you will want sunscreen, hats, sunglasses and water. If you are going past Pu'u Huluhulu, to the other trails you will want food and if you are going past Mauna Ulu you need to tell the park and take supplies for overnight camping. Pu'u Huluhulu is about an hour to hike out to. The hike is very easy over medium lava. The trail is very well marked. 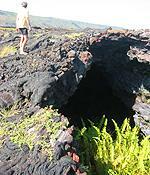 You will pass through open lava fields as well as short shaded areas. You also pass through some fairly nice lava trees. Clearing the lava trees you can see our objective, Pu'u Huluhulu - a lush, green forest covered hill with a dimple on the top - and it looks pretty high. The trail takes you to the top for a spectacular view of the surrounding area as well as Pu'u O'o vent. As you continue on the trail you eventually angle to the right and then the path takes you up on fairly recent (70's and 80's) lava and around the base of Pu'u Huluhulu. As you round the right side the trail splits with a sign. Going straight takes you onwards to the Mauna Ulu and Napau Trail. 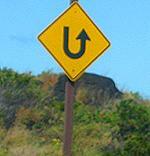 If you make a left you go up the side of Pu'u Huluhulu. Make a left and go up the side of Pu'u Huluhulu. This is zigzag trail goes through lush forest as it winds its way to the top of the hill. While the view of Pu'u Huluhulu looked very high from the trail - it is really only a couple hundred feet high and just about the point where you get winded you will suddenly be at stairs that take you a few steps up to the very top. The view from the top is fantastic on a nice day. Standing at the top of the stair, looking to your right the large hill in front of you is Mauna Ulu crater. To the left of Mauna Ulu, way in the distance is Pu'u O'o vent - look for the smoke coming from the vent to find it. Before leaving note the lush forest in the Pu'u Huluhulu crater itself, as well as the perched lava pond between Pu'u Huluhulu and Mauna Ulu (the large round flat expanse of lava). When you are done, descend the hill the way you came up. If you intend to go on, Mauna Ulu is another 20 minutes to the top, and an additional 1 to two hours to go around. 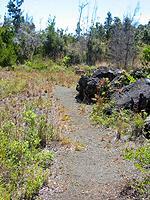 Because Mauna Ulu is a rather recent cone it has fragile sides and you should walk very carefully if you do this trail. There is really not much of a trail, people just go up the side - but it is easy to break through the ground into shallow lava tubes - so walk slowly and carefully and avoid hollow sounding areas. Going around the top of Mauna Ulu is fun. The crater inside is very deep and it is an interesting hike around, and then back down. If you intend to do Napau Trail or hike the Pu'u O'o vent - these are very advanced trails that require notifying the park and taking survival and camping equipment. 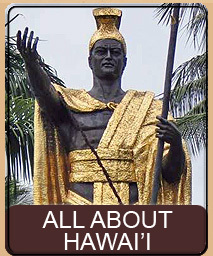 However, Pu'u Huluhulu and Mauna Ulu are very easy and enjoyable. If you are interested in the Hike described above click here to read all about Pu'u Huluhulu and Mauna Ulu Hike. At odometer 4.2 you will see a right hand turn that takes you about 25 feet to a locked gate. There is a bit of space to pull off on the right side just before the gate. Note: if the gate is open do not drive in as you might end up getting accidentally locked inside. 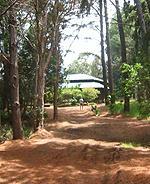 A number of trails are available by walking down the road, but of particular interest is the short walk to the 'Ainahou Ranch. 'Ainahou Ranch is in the National Register of Historic Places and was built in 1941 by Herbert Shipman, a local businessman who was also responsible for helping restore the Nēnē Goose, the state bird. The huge house sits on a 64,000 acre ranch and the landscaping around the house is spectacular and includes many flowering plants and fruit trees. 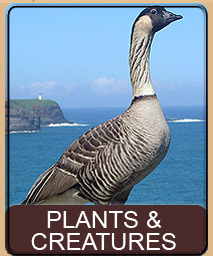 It is almost certain that you will see Nēnē at the ranch or along the trail. The trail itself is along a road and is about 2 miles long to a split in the trail. Taking the right fork leads you a short distance to the ranch. A wonderful place to bring a picnic lunch, this is an easy hike and very pretty. Please read the entire Hike description by clicking here. As you proceed past the ranch turnoff you start to enter an area where the tree line is thinning due to more recent lava flows. As you approach odometer 6.2 you will have a spectacular view of Mauna Ulu on the left, with Pu'u Huluhulu to the left of it. At odometer 6.2 is the pullout for Mau Loa O Mauna Ulu, which translates to Mauna Ulu forever unceasing (roughly). This is a vast pahoehoe lava field that resulted from the 1969 through 1974 eruptions from Mauna Ulu. At the pullout is the Keauhou Trailhead, which is a overnight hike that leads to Keauhou on the ocean and back up near Kipuka Nēnē on Hilina Pali Road. Even though the most recent flow here was in 1974 you can see that already 'Ōhi'a Lehua trees, with their bright red Lehua blossoms, are staking out their ground. At odometer 7.2 is a pullout on the right hand side for Muliwai a Pele. 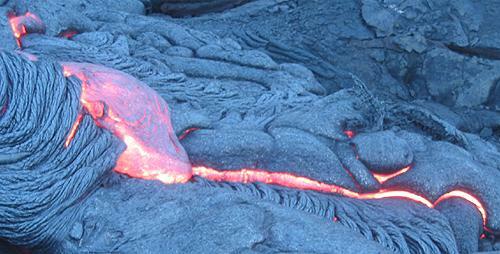 The Hawaiian word Muliwai (moo-lee-why-e) means river so this translates to a river of lava. When used as a volcano term, Muliwai refers to an area, usually down a slope, where lava poured like a river. They are very obvious because the lava builds up banks and forms a trough. When the lava drains the trough and banks remain. A muliwai can span for many miles, often going from a rift in the volcano all the way to the ocean. They can drag rocks along the way which tumble as the are carried by the lava river and form huge round boulders - some larger than cars but almost perfectly round. This particular muliwai formed in the 1974 eruption of Mauna Ulu and is almost 5 miles long. There is a boardwalk at the parking area that takes you about 30 feet to a viewing area where you can look down on the muliway. However, the best viewing is actually on the road where it intersects the muliway. You can get a better feel for the channel of lava and also see it well on both sides of the road. 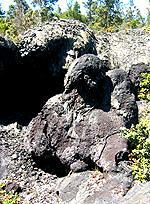 There are many muliwai on the Big Island, and unfortunately Muliwai a Pele is not the most stunning example. A fantastic muliwai is on the Mauna Loa Strip Road in Volcano and there is another wonderful muliway between South Point and Captain Cook that is intersected by the highway. As you leave Muliwai a Pele, at odometer 7.5 on the right is an unusual rock. Formations like this are created when a cold chunk of lava - part of an older flow, is lifted up from beneath by molten lava. You can see how the top is a fairly flat chunk of pahoehoe that has been coated by the lava... and you can see how the lava has pushed upwards, due to the pressure of the flow and lifted the older lava upwards. When watching lava flow you will often see pieces of ground lifted into the air, tipped on angles or even flipped over as the pressure of the liquid rock breaks through the surface. At odometer 9.6 is a pullout on the right hand side for Kealakomo. We fondly call this Pizza Hut because the roof is shaped like the popular restaurant chains roof. This is a great handicap accessible overlook with a spectacular view - if the weather is good. 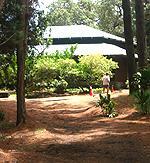 The shelter is large, with picnic tables - but this is usually a very windy spot so be prepared. The shelter is built on Holei Pali and overlooks an over 2,000 foot drop, and out to the ocean. From the overlook, on a clear day, you can easily see South Point in the distance. Kealakomo Overlook looks straight out to where a 1971 lava flow buried the costal village of Kealakomo. Across the road from Kealakomo Overlook is the trailhead for Naulu Trail. This is part of a much larger trail, one that takes about 10 hours to complete. However, The Naulu Trail portion is a fairly short, 2 mile (one way) walk out to the junction with Kalapana Trail. At the junction, leaving the trail at an angle you can find the original Pulu warehouse foundation and not much further, Napau Crater. On a clear day Pu'u O'o is visible from the junction. Note that doing the entire 10 hour Kalapana Trail requires you to leave notice with the park rangers at the visitors center. Stitched photo of coastline from Kealakomo Overlook. Another excellent view of the coast and pali (hill) is at odometer 10.2 and the Hālōna Kahakai pullout. As you continue past the overlooks, the road begins to go downward and offers a fantastic view of the coastal flats over 1,500 feet below you. You can see the small ribbon of highway and often, tiny dots of cars way below you as you descend the cliff side. 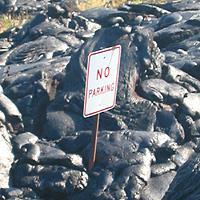 At odometer 11.5 the road is cut through solid lava rock and takes a 180 degree hairpin turn. The walls around you, through the turn, are riddled with tiny lava tubes that show the various layers that overtime built this portion of the pali. In the middle of the hairpin turn is a very long pullout on the left. This pullout offers a good view of the area below and you can see the cars parked for the lava in the distance - and if the lava is flowing in that area, the red glow and steam cloud of the lava. As you come down the side of the pali the road curves again near the base and a sign marks the area as Alanui Kahiko at odometer 13.7. A small pullout is near the sign. This area marks the old road that was covered over in the 1972 Alae Lava Shield flow. If you look closely you will see the old highway peeking out through the lava about 50 feet away from you. As you continue down the pali you have still not descended to sea level and a variety of lava flows are on both sides of the highway. Just before you get to odometer 14.9 look left and you will see a small hill - and if you look very carefully you will note that there is hole at the top of the hill. Slow down as you go by the hill and you will also see a cave in the side of the hill. This is a lava tube where lava once flowed through the tube and into the ocean. Just past the hill is a small pullout on the left. You can park at the pullout and explore the lava tube. Please read the entire Lava Tube Climb description by clicking here. As you reach odometer 15.9, at the emergency telephone, you will see a pullout on both sides of the road - park at either one. The trail on the right side of the road takes the backpacker out to 'Āpua Point and then further to Keauhou. This is an overnight trail and you need to be very prepared. The 0.7 mile trail on the left side of the road takes you out to Pu'u Loa Petroglyph Field - a wonderful walk with many discoveries. Once you reach the end of the trail (about a 20 minute walk) you will find a wooden boardwalk surrounding some representative petroglyphs. While there are many nice petroglyphs within the boardwalk area, the best petroglyphs can be found by leaving the boardwalk. 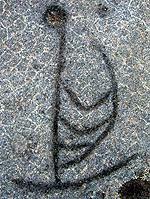 There are over 15,000 individual petroglyphs in the field. Please read the entire Trail description by clicking here. The full trail description has important information that you should read before doing this trail! As you leave the petroglyph field and continue down the road you do the final drop to sea level and then curve to the left at the ocean. At odometer 18.3 (as of June 18, 2004) the road ends. The road was overrun by lava at about 19.3 mile mark in early 2004 so the park has pushed the current end of road about a mile before the lava. At the 18.3 odometer is (currently) a turnaround with a small ranger shed and bathrooms. Take the turnaround and park at the first available spot on the right. 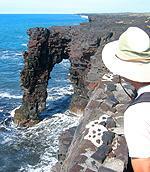 At the end of the road, across from the ranger shed is a 40 foot trail to the ocean and the Holei Sea Arch. Sea arches are formed when a portion of a lava tube in the cliff is exposed to years of exposure to surf and erodes to leave only an arch. These interesting natural structures have only a limited lifespan and this arch will eventually crumble and no longer be a feature. As of the time of this writing there was lava pouring into the ocean. The current vent is Pu'u O'o which sits about 7 miles behind you at about 3,000 feet - you can probably see the smoke from the volcano over the pali. Depending on what the lava is doing it normally flows in lava tubes from the vent towards the ocean. 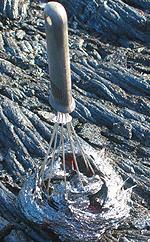 In places where the tubes are obstructed the lava will breakout at the surface and be visible. If, and when (as it is doing right now) the lava makes it all the way to the ocean it pours into the ocean making a spectacular display. Both surface breakouts and ocean entry are beautiful - however, surface breakouts can also be fun. Bringing sticks to poke into the 2000°F lava - and just the camera opportunity to photograph rock being created is awe-inspiring. 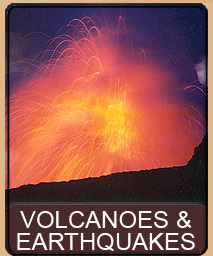 If you intend to view the lava you should read our complete guide to lava viewing. Molten lava oozes from a surface breakout near the ocean. Since this is a dead end road returning home is easy. Just go back the way you came in. This page is named 'Drives.chain'. Can't Find It?